Temperature Compliance logs and alerts from any storage area. FreshLoc wireless temperature monitoring sensory networks can protect critical temperatures in any hospital department, on any floor. They are used by food service, pharmacy, laboratory, blood / organ storage. Applications are always expanding. The system sends accurate reports, formatted to each user's needs, to designated staff members, and can be accessed online. 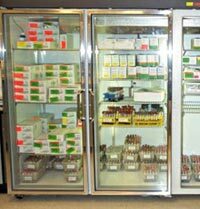 Accurate, continuous records of temperature are required by JCAHO inspections for correct storage of medication in healthcare refrigeration locations. FreshLoc is ideal for tracking temperatures throughout a hospital because it is scalable. A solution that tracks temperature for foodservice may cover the kitchen and refrigerators on every floor. That same system can pick up medication storage or blanket warmers, for example, and can add other points as required. All the information is organized to allow access to the appropriate individuals, online. FreshLoc sends digital alerts about out-of-range temperatures to allow maximum response time. The system gives managers enhanced control over assets, equipment and staff, increasing accountability across the board.